The Swiss air force is beginning to test foreign warplane designs as part of a lengthy and much-delayed, $8-billion effort finally to replace the air arm's old Northrop Grumman F-5E/F Tiger fighters. On April 12, 2019, two Eurofighter Typhoons -- an FGR4 single-seat, multi-role variant and a T3 two-seat trainer, both operated by British Aerospace -- reportedly flew missions from Payerne. "A Swiss evaluator was noted flying in the two-seater," Scramble magazine reported. Switzerland is testing five different aircraft. Beside the Typhoon, the candidates including Boeing's F/A-18E/F Super Hornet, Dassault's Rafale, Lockheed Martin's F-35A Lightning II and Saab's JAS-39E/F Gripen. 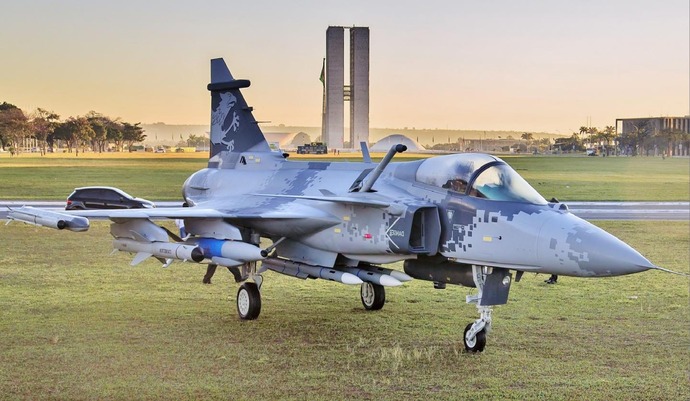 "Between April and July 2019, the five candidates will be in Switzerland for aerial and ground tests for a period of two weeks each, with public viewing opportunities," according to Scramble. The Pentagon's biggest weapons supplier is the first major defense company to report first-quarter earnings this week, which Wall Street generally expects to be higher than a year ago as the industry benefits from increased U.S. defense spending and global demand for jets and munitions. Its results sent the whole sector higher, with Northrop Grumman Corp, Raytheon Co and General Dynamics Corp shares all up more than 2 percent. Lockheed's Missiles and Fire Control business, which makes missile defenses like the Terminal High Altitude Area Defense (THAAD), was one of its best-performing units. The world-famous acrobatic team is transitioning from older Hornets to newer, but not exactly new, Super Hornets.